High efficiency NMEA amplifier 4 outputs. 1 opto isolated high sensitivity input. 4 high power outputs. 1 coupling input/output . Gain> 1000 . 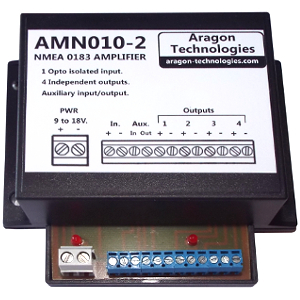 The AMN010-2 is a high efficiency NMEA amplifier. It corrects and amplifies the NMEA signal and send it on 4 independent NMEA outputs, which allows you to connect a device (eg, GPS) to multiple NMEA devices without risk of disruption due to an overload of the NMEA bus. Its NMEA input is optically isolated to eliminate the risk of disruption from ground loops or floating reference levels. Entry does not load the NMEA source to which it is connected. Its powerful and independent outputs can be used with any NMEA device whatever its input impedance. It solves the problems encountered with some devices where NMEA input becomes very low impedance when its power is off. It has an auxiliary input and output for coupling as many AMN010-2 as necessary to obtain the desired number of NMEA outputs. Its amplifacation ratio is greater than 1000. It works up to the 38400 baud (normal baudrate of NMEA0183 is 4800 baud), which allows you to use it also with AIS signals. 1 High sensitivity input with opto isolation. 4 independent high power NMEA outputs. 1 Auxiliary Input / output TTL levels for the coupling of several modules. Speed ​​up to 38400 baud. Compliant with NMEA 0183 standard. Visualization of the data transfer by LED. 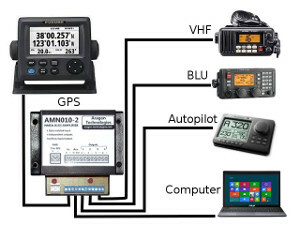 Why use a NMEA amplifier? An NMEA output should never be connected directly to several NMEA inputs due to the low impedance of NMEA inputs. There is a risk of loss of data and information used by different devices are not reliable because outdated. One device can disrupt all other devices. 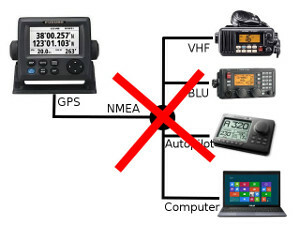 Overloading the GPS NMEA output may cause data loss and malfunctions. Some devices cause a total collapse of the NMEA signal if they are directly connected to the NMEA bus while they are off. The output of the GPS is no longer overloaded and the signal is sent with its optimum level to all devices. Each output is independent. A device can no longer disrupt the others. The use of an amplifier NMEA is the assurance of a safe and reliable NMEA network. The reliability of NMEA data is very important in the case of the use of an autopilot system controlled by the NMEA bus. The NMEA amplifier AMN010-2 has a special intput / output for coupling as many MNEA010-2 as necessary to obtain the desired number of NMEA outputs without using any power output for coupling. The first module receives GPS data on the normal NMEA input. Data is available on the 4 power outputs (1-4). The coupling output is used to send data to the second module which receives data on its coupling input. In addition to providing data on the power outputs (5-8), it provides data to the third module by its coupling output... It is thus possible to connect as many modules as required to obtain the desired number of outputs.